Johnnie Walker, spelled with "i-e" not with "y", is a staple in the world of drink as one of the most recognisable brands of Scotch Whiskeys on the planet. - The term "Scotch Whiskey" merely refers to a whiskey made in Scotland. - adbrands.net published a list of the Top 25 International Premium Spirit Brands in 2010 on data taken from The IWSR (International Wine & Spirit Research) which ranked Johnnie Walker as third with 15.5 million cases sold worldwide. Smirnoff (vodka) was first with 24.4 million cases and Bacardi (rum) was second with 18.7 million. Back in 1908, the label starting using an illustration of a striding man, the likeness of John Walker, the creator of the original whiskey. The parent company says this symbolises forward thinking and the pursuit of excellence. It has made use of this idea in a number of innovative commercials which do more than just advertise the product; they tie the product to great achievement. While one may conjecture as to whether Albert Einstein or Gandhi or Marin Luther King Jr. drank Johnnie Walker and as to whether such a drink contributed in any way to their respective accomplishments, we can all appreciate very original marketing campaigns which mark the attainment of artistic merit albeit small and succinct. An android sits in a library of the future saying, “I am faster than you, stronger than you. Certainly I will last much longer than you. You may think I am the future. But you’re wrong. You are. If I had a wish, I'd wish to be human”. Outside now, the android turns in the sunlight. “To know how it feels to feel”. The android sees a butterfly and grabs it. The camera focuses on the hand opening and letting the butterfly free. However, the scene is back in the library with the seated android. The released butterfly provides a point of continuity for the soliloquy. “To hope, to despair, to wonder, to love. I can achieve immortality by not wearing out. You can achieve immortality simply by doing one great thing." The background music stops with dramatic effect as we hear the words "one great thing". The setting, the idea of an android talking, the music, the soliloquy, it all adds up to a powerful moment and a powerful message. We don't need to wait for breakthroughs in medical science. We don't need special diets, herbal remedies or acupuncture. We don't need artificial limbs or pacemakers or even cryogenics to preserve our bodies for the distant future. We can all achieve immortality right now... simply by doing one great thing. Scotch whisky (often referred to simply as "Scotch") is whisky made in Scotland. The Johnnie Walker Human ad was developed at Bartle Bogle Hegarty, London, by chairman and worldwide creative director John Hegarty, copywriter and art director Justin Moore and Steve Robertson, with producer Kristin Armstrong. Filming was directed by Dante Ariola, with MJZ, with producer Debbie Turner. Editing was done by Andrea McArthur at Peepshow, London. Post production was done at The Mill, London, with producer Helen Hughes, Lead Flame Chris Knight, Lead 3D producer Gil James, Lead 3D Supervisor Russell Tickner. Flame artists were Richard Roberts, Coory Brown, Dave Birkhill. Flame Assists were Mark Payne, Stirling Archibald and Sheldon Gardener. 3D artists were Christ Rabbet, Eva Kuehlmann, Daniel Hope and Vincent Baartsoen. The Mill’s new podcast channel includes a video showing behind-the-scenes development of the visual effects. Original music was composed by Peter Challis, Marc Teitler and Bernd Würtz at A-Bomb, London. 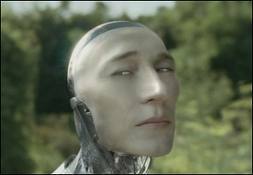 Really cool ad featuring the musings of a highly intelligent android who wants to have human beings' innate drive and creativity that cannot be manufactured. It's an antidote to the prevailing idea that the future will be dominated by technology and run by machines. This film uses the Johnnie Walker idea of 'Keep Walking' as an opportunity to celebrate human potential. With such a thought-provoking creative idea, it really challenges the viewer. Could it even be considered one of the most intelligent ads ever made?